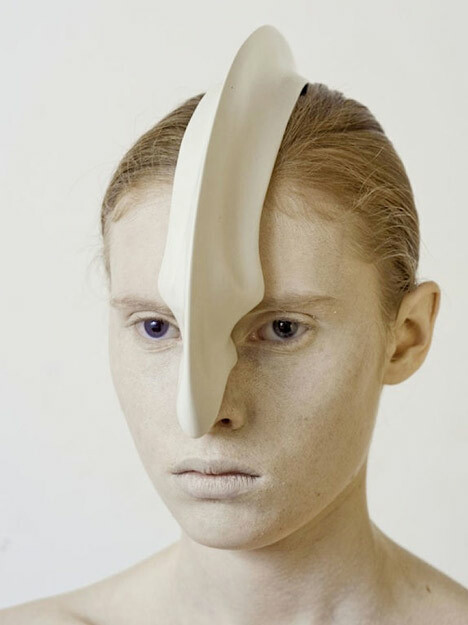 London College of Fashion graduate Ana Rajcevic has created a series of tusks, horns and spines for the human body. 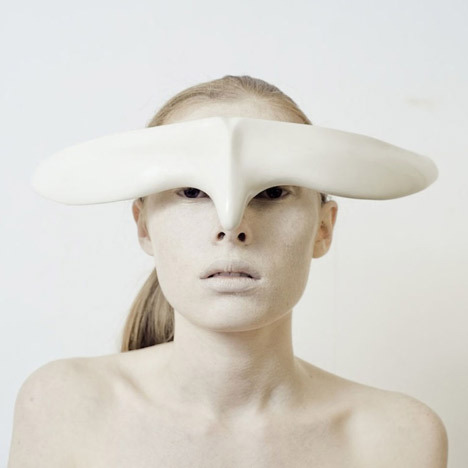 Called Animal: The Other Side of Evolution, the sculptural pieces are based on exaggerated animal skeletons and designed to fit over the face, neck and head. 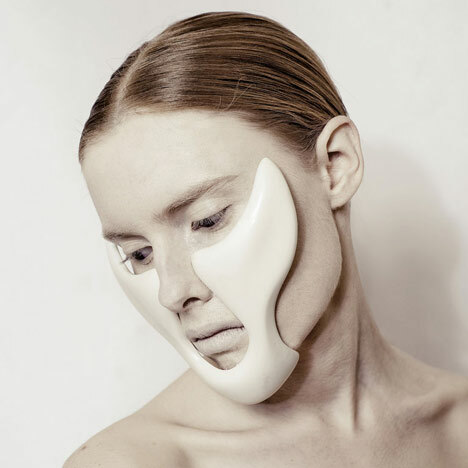 They’re made in complex moulds from fiberglass, resin and silicone. 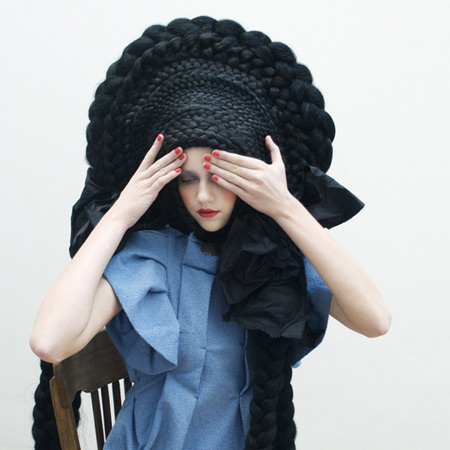 Rajcevic’s project won the London College of Fashion MA Design Award 2012. 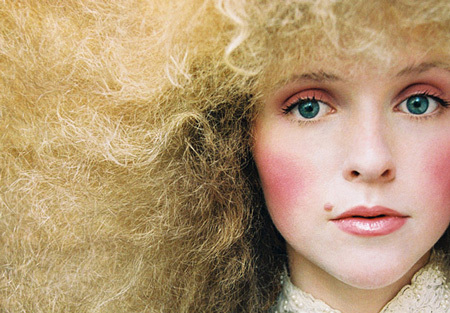 Photographs are by Fernando Lessa. 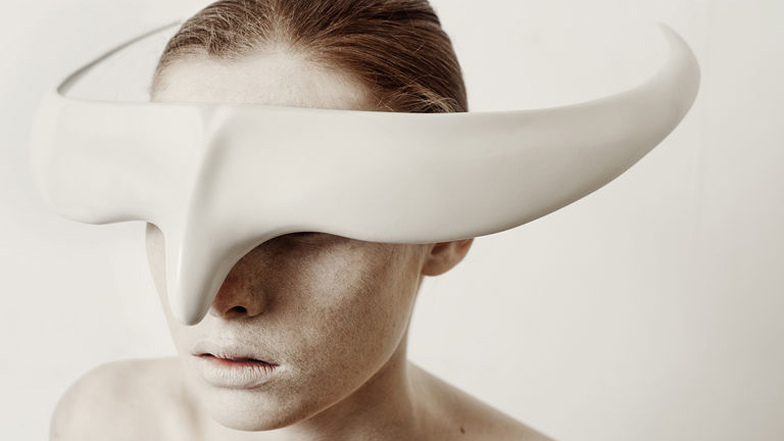 The project is grounded in a unique visual interpretation of animal anatomy, building upon existing skeleton structures to create a series of sculptural pieces that appear as natural properties of the human body, suggesting strength, power and sensuality. 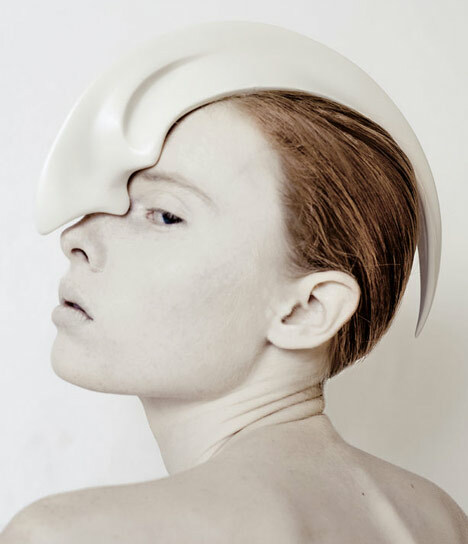 Concepts of mutation and evolution are explored in order to develop a contemporary cross-image of human and animal, an atemporal, supreme creature, beyond past and future.The goal was to fabricate a collection of 8 pieces of personal adornment, that would not be specifically categorised as jewellery or accessories. 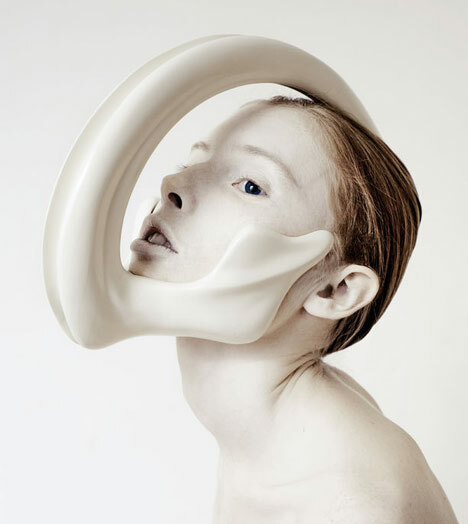 The idea was to step out of the traditional jewellery/accessories context in order to develop a ‘new breed’ of precious objects that can be exhibited both separately on their own and fully attached to the human body.All of the objects were handcrafted creating multi-part master molds, using gelcoat, fiberglass, resin and silicone rubber. 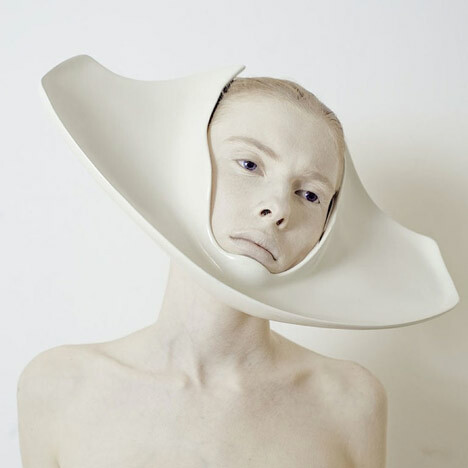 The pieces perform a double function: they exist as fashion objects attached to the wearer, as well as separate art works, exhibited in gallery spaces. Because of this dual quality they can be considered fashion artefacts in the true sense: objects of desire, rather than just mere adornments. 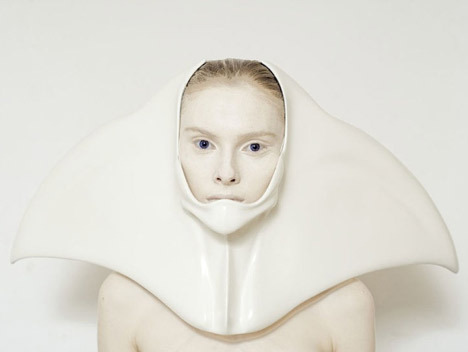 “The first dress we made was shaped like the moon,” said van Herpen. 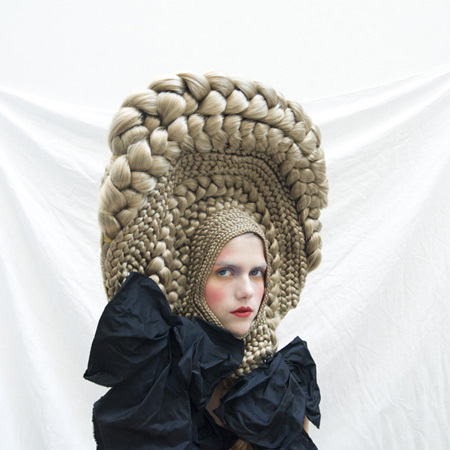 “With the second, I wanted the material to grow around the body more organically.” Each of the two garments took three weeks to construct. 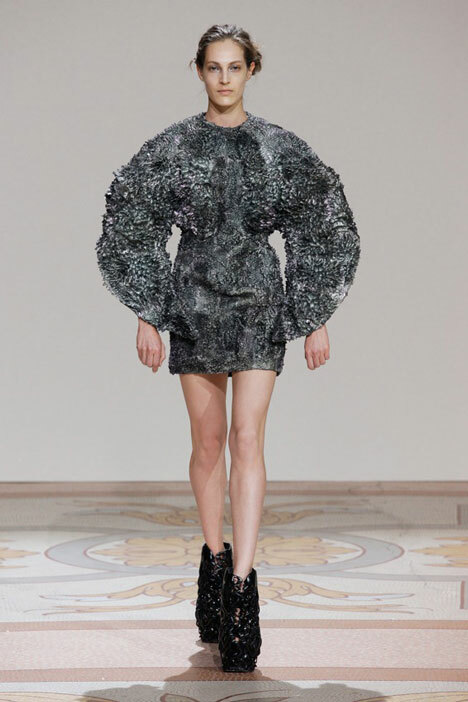 The dresses were shown as part of Iris van Herpen’s Autumn Winter 2013 fashion show in Paris earlier this month, where outfits were accompanied by 3D-printed shoes that look like tree roots. 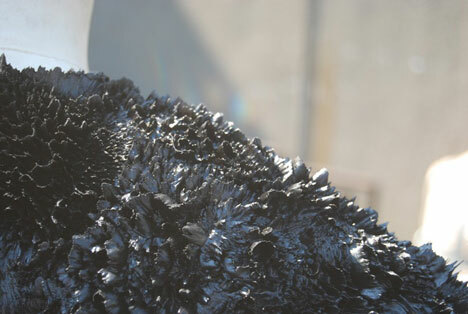 “The original idea was to have a dress growing live during the show through magnetism… so people could see the birth of the dress, how the dress would grow,” van Herpen said, though this proved too complex and potentially unsafe for the models. An online doctor’s surgery asked 18 designers to amend an image of a woman in her underwear to reflect the ideal body in their country – and were left astounded by the results.Perfection appeared to vary considerably depending on the country, with Spain opting for a fuller-figured look and China Photoshopping the model to the opposite extreme.Other countries involved in the survey included the UK, the US and the Netherlands, as were Italy, Egypt and Syria. The original image that that was sent to 18 designers around the world to Photoshop, left, and how the UK, presented its ideal woman; the USA opted for bigger hips and a small waistThinnest of all were the retouched pictures from China and Italy, which in both cases, also amended the model’s other physical attributes and underwear. The resulting designs had estimated weights of 7st 3lb and 7st 7lb and Body Mass Indexes of 17.0 and 18.0 – the latter based on the assumption that the model was 5ft 4″. Colombia opted for a more curvaceous woman, while Mexico slimmed her hips – China’s designer opted for a very slim frameThe remaining Photoshopped bodies all came within the healthy weight spectrum, although silhouettes varied considerably.In the UK, a boyish shape with a large bust proved popular, while in the US, Kim Kardashian-style curves and a noticeable thigh gap was most liked.The Philippines opted for a similar, if slightly thinner, silhouette to the UK while Venezuela wanted a curvaceous body with a very large bust. Ron Mueck early career was as a model maker and puppeteer for children’s television and films, notably the film Labyrinth for which he also contributed the voice of Ludo, and the Jim Henson series The Storyteller. Mueck’s sculptures faithfully reproduce the minute detail of the human body, but play with scale to produce disconcertingly jarring visual images. His five metre high sculpture Boy 1999 was a feature in the Millennium Dome and later exhibited in the Venice Biennale. Today it sits as the centerpiece in the foyer off the Danish Contemporary Art Museum ARoS in Aarhus. 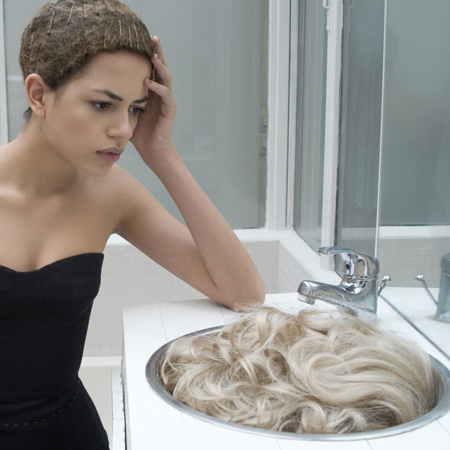 In 1999 Mueck was appointed as Associate Artist at the National Gallery, London. During this two-year post he created the works Mother and Child, Pregnant Woman, Man in a Boat, and Swaddled Baby. It’s been a slow and steady battle, but bodies of all shapes and sizes are slowly starting to get some recognition in the fashion industry. 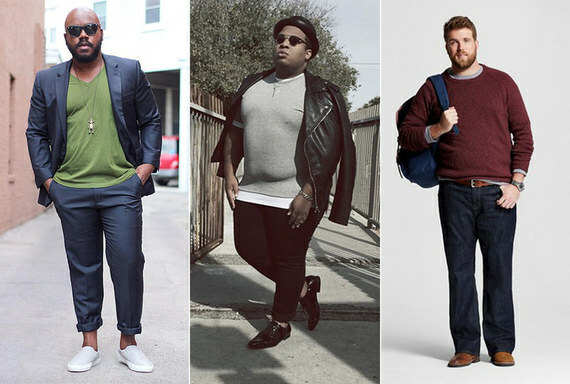 Plus size models like Tess Holliday and Ashley Graham are booking gigs like crazy, and everyone is starting to see that variety will only make things better. One perfect example of this is Dexter Mayfield, a California-based dancer and now, bonafide plus-size model who absolutely killed it on the runway for Marco Marco. At Marco Marco’s Los Angeles Fashion Week show, Mayfield took the runway alongside plenty of RuPaul’s Drag Race winners, and the world went absolutely nuts. Mostly because he has the fiercest walk of all time. Like, seriously, if you are ever feeling down on yourself and need to portray total confidence, channel Mayfield. His self-assured strut is the inspiration we all need in our lives. Born and raised in Dallas he first discovered his love for dance in church, later moving to Los Angeles where he’s danced in Jennifer Lopez and Sara Bareilles music videos. Having worked for big US brands including Target, Dreamworks, and Verizon and choreographed a stage show called Posers, which are impersonators – he’s already on the road to success. Now Dexter has turned his attention to the world of fashion proving it needs a fun injection after comedian Sam Kalidi posted the lingerie designer’s footage to Facebook and amassed almost three million views in just two days. Artwork on the back of Yi-jun, shown during the 2010 Taiwan International Tattoo Convention in Taipei, on July 31, 2010. The convention aimed to gather people from all over the world to promote the industry and garner positive thinking towards tattoos. 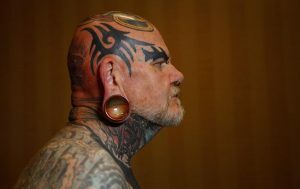 Contestant Yoshi shows off the back of his full-body tattoo to judges at the National Tattoo Association Convention in Cincinnati, Ohio, on April 13, 2012. Yoshi, from Japan, was tattooed by Horiyoshi III and is a multi-award winning contestant in the world of full-body tattoos. In Cincinnati he won third place in the “Best Tattooed Male” category. 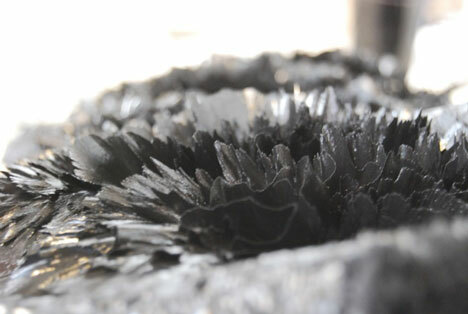 Picture taken April 13, 2012. Jeff Bitting (right), from St Augustine, Florida, speaks backstage with fellow full-body tattoo contestants before judging at the National Tattoo Association Convention in Cincinnati, Ohio, on April 13, 2012. In his 33 years of getting tattoos, Bitting says he has had about 500 hours of work and will complete his other leg in his bid to win more full-body contests. 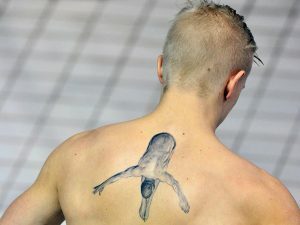 Jesper Tolvers of Sweden displays his diving tattoo as he prepares to compete during the Men’s 3m Springboard Diveoff at the FINA Diving World Cup at the Olympic Aquatics Center in London, on February 26, 2012. 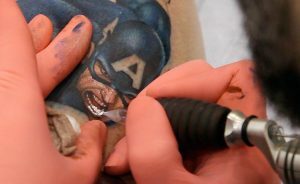 A tattoo of Captain America drawn by artist Sean Karon on the leg of client Ron Raucci at the Hampton Roads Tattoo Festival in Virginia, on March 2, 2012. The tattoo was completed from start to finish in one five-and-a-half hour session and won the prestigious “tattoo of the day” contest. 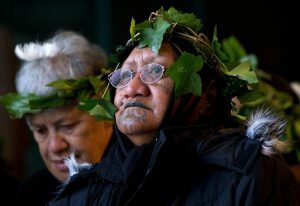 Members of The Tainui Waka Alliance tribe welcome the return of 20 mummified tattooed Maori heads (Toi Moko) that were taken to Europe in the 1700s and 1800s, during a ceremony at Te Papa Museum in Wellington, New Zealand, on January 27, 2012. The tattooed heads were handed over by French officials at the Quai Branly Museum in Paris after a four-year political struggle. The Maori heads were once warriors that tattooed their faces with elaborate geometric designs to show their rank and were an object of fascination for European explorers who collected and traded them from the 18th century onwards. 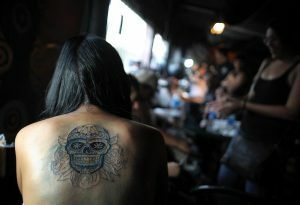 A woman takes a rest as she has her back tattooed during the San Salvador Tattoo Fest in San Salvador, on March 3, 2012. The tattoo festival aimed to promote tattoo art in the rather conservative Salvadorean society. 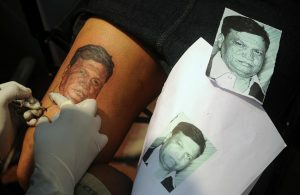 Indian student Nikita Raut has an image of her father, Ravindra Raut, inked on her thigh at a tattoo convention in Mumbai, on June 15, 2012. The event is a showcase of tattoo art which has for centuries been used in India for religious symbolism but is now emerging as a fashion statement amongst the young and trendy urban youth. 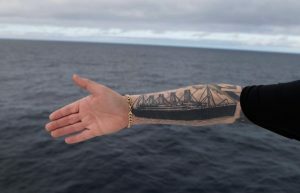 Derek Chambers from Belfast shows his tattoo of the Titanic, aboard the MS Balmoral Titanic memorial cruise ship in the Atlantic Ocean, on April 12, 2012. Nearly 100 years after the Titanic went down, the cruise with the same number of passengers aboard set sail to retrace the ship’s voyage, including a visit to the location where it sank. 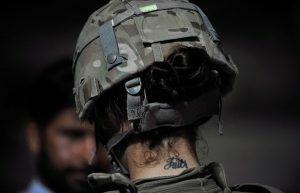 US Army soldier Michelle Byrnes from the HHB 3-7 Field Artillery Regiment 3rd Bct 25th ID scans fingers of an Afghan man with Automated Biometric Identification System during a mission in Turkham Nangarhar, Afghanistan, on September 28, 2011.